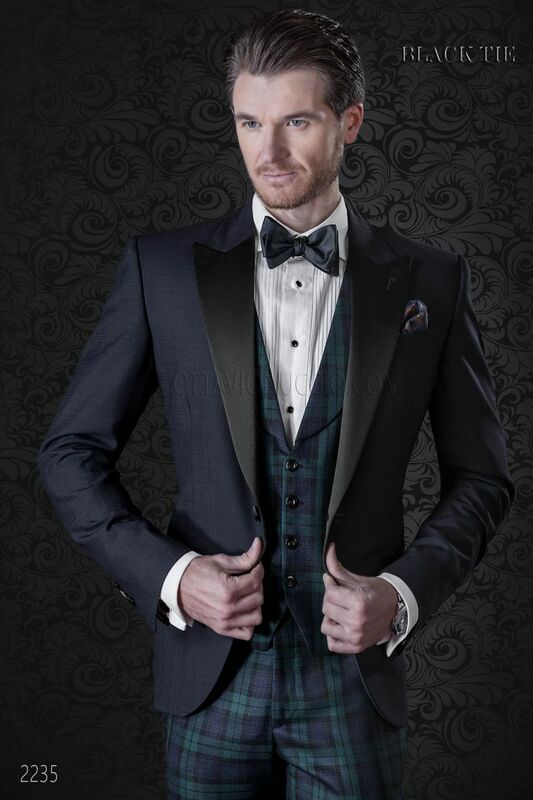 Blue wool checked tuxedo jacket which can be used individually or with paired with pants of the same fabric. The lapel i... Blue wool checked tuxedo jacket which can be used individually or with paired with pants of the same fabric. The lapel is peak shape, wide and in black satin, which gives more elegance to the look. On the front side the jacket has 1 black covered button and straight jet pockets with contrast fabric details, typical feature of the tuxedo. Sleeve with 3 covered buttons in contrast and back side with no vents: this feature gives the jacket a simple and clean line. This jacket is suitable for men of any height. Pañuelo de seda estampada fondo azul.